Elvis, showgirls, crooners and the Rat Pack may be a thing of Las Vegas history. But their memories live on. 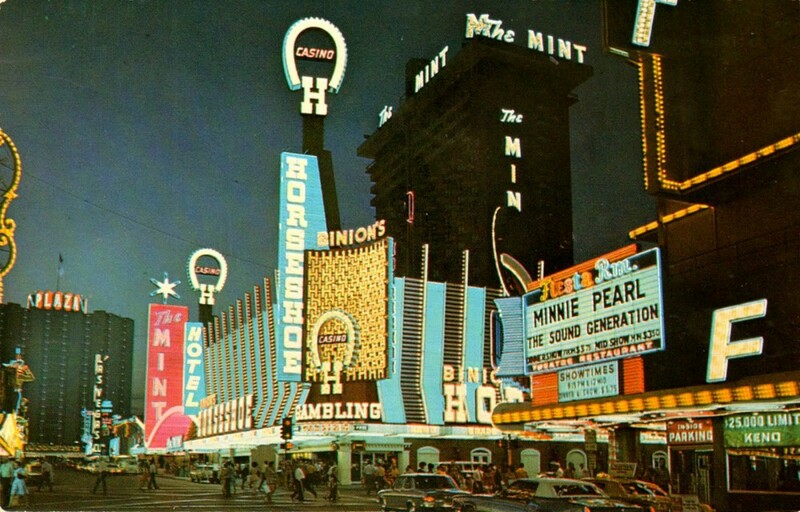 Come and take a trip with us as we explore some Vintage Las Vegas history. Famed neon signs from casinos such as Stardust, Caesars Palace and El Rancho, glittering and sparkling like stars in the Nevada desert, lured people from all over the continent. Las Vegas was THE place to be and to be seen. In 1969, the brand new International Hotel with the largest showroom in the city, boasted it had booked Elvis Presley to perform 57 shows over four weeks with them. The King of Rock was back in style (and earning big bucks). At the Stardust, Vegas visitors could get a a panoramic view of our solar system. How? Well, at the sign’s center there was a 16-foot plastic model of the Earth with “cosmic rays of neon” beaming its light from behind the model Earth in all directions. At The Thunderbird (later to be known as the El Rancho), legendary crooner Nat King Cole had started performing back in 1948 already. The Thunderbird was also the place where Rosemary Clooney made her first appearance in Las Vegas in 1951, and where Judy Garland made her final Vegas appearance ever, in 1965. But Vegas is not only about neon, all you can eat buffets, showgirls and Elvis. The reason why we all go to Vegas is spelled with a captial G. Gambling. Even Mister 007 him self tried his luck playing Craps in Las Vegas in Diamonds are Forever with femme fatale Plenty O’Toole. Apparently, he had only played it once before. Something James Bond (or probably Don Draper of Mad Men fame for that matter) is known to favor and play more often is Baccarat. The game is a longtime mainstay in Monte Carlo and may be the simplest game to learn. There is only one decision for a player to make – whether to wager on the “player” or the “bank.” In the first ever Bond movie, Dr. No from 1962 starring Sean Connery, Bond gets the admiration for his “luck” from a certain lady in red. Another Casino table game that is very popular is Blackjack, the quintessential Las Vegas casino gambling experience. The object of the game is to get your hand closer to 21 than the dealer’s without going over. Everyone at the Blackjack table plays against the dealer. Blackjack is not a hard game, but requires strategy. Be your own leading lady or James Bond and learn how plan your Blackjack strategy at Ladbrokes casino UK – who knows what could happen!